The sim was crowded when I got there, so it took a while for the stage, and the actors, to rez. The actors portrayed God and the Devil, Adam and Eve, and various angels. The show was all in dance and gestures, with no words. Once it was over and the audience gave their applause, they changed to their normal looks and chatted with anyone who wanted to talk. Some just had a little fun with gestures, such as **Under the mighty hand of God!! ** which squished an avatar flat on the ground. Pet mentioned others in Unity, such as Liliana Dinzeo, Sixgin Ayres, and Levi Soulstar, who helped make the group what it is, “It’s been fun.” Of Jewel Lordhunter, “Jewel is new to Second Life, but she felt God’s planing.” Liliana was also somewhat new when she first came across Unity. 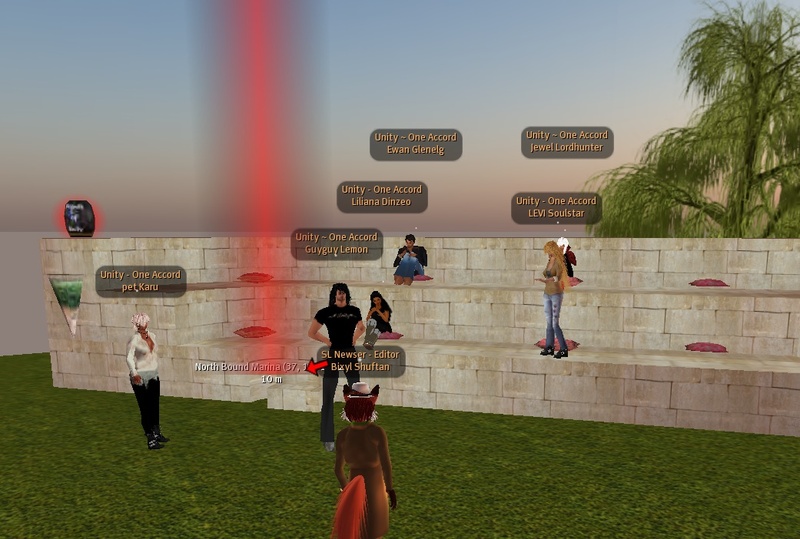 “For us, real life and Second Life blend,” Pet told, adding they wanted to appear friendly and approachable to others, “not like the church people they ran away from.” She brought up that Metaverse TV had sent someone to their show earlier, and was happy to have the attention of the press. Pet mentioned the “argue ball,” a ball of emotes people with disagreements sit on and have the option of various gestures such as poke and shove. The purpose of it was to make fighting look silly. Pet introduced other members of Unity. Ewan Glenelg had once been a pastor of a church in Second Life. He saw the Unity group as a way to both express his faith and use his theatrical background, “It’s been a blessing to help.” He and his wife also run North Bound Marina and Sugar Shore Ballroom. 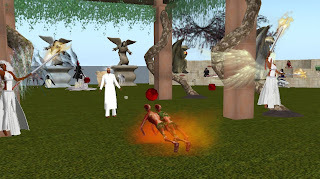 Pet also mentioned others not present during the discussion, such as Sixgin Ayres, who played Adam, who runs Church of the Living God in Second Life. There were also Lukes LionHeart, Shan Charisma, Miles303 Parkin, and Lycan444 Denfu. “The Creation Story” performs over North Bound Marina every weekend this January, Fridays at 6 PM, Saturdays at 2 PM, and Sundays at 4 PM. The location is at North Bound Marina at ( 22, 37, 1142). They also have a website at www.unity-productions.org. They are currently raising funds for Heifer International. "The goal of UP is to portray that Christians are not the intolerant fuddy-duddies or bigots that has been portrayed globally for centuries. We aspire to share the love of God with all who will listen; using various mediums - the arts. traditional bible study, inter-faith discussions. Anyone can open a church, but UP provides us the latitude of presenting our Creator in a fashion that is comfortable and removes the ho-hum from a starched sermon. We try not to pound the Bible into your head, but instead to drive hard the point of the unfailing vastness of God's love to mankind."